I don’t like to see people get fired. Especially when I feel attached to them. When Michael Bloomberg took over BusinessWeek, I swore it off. 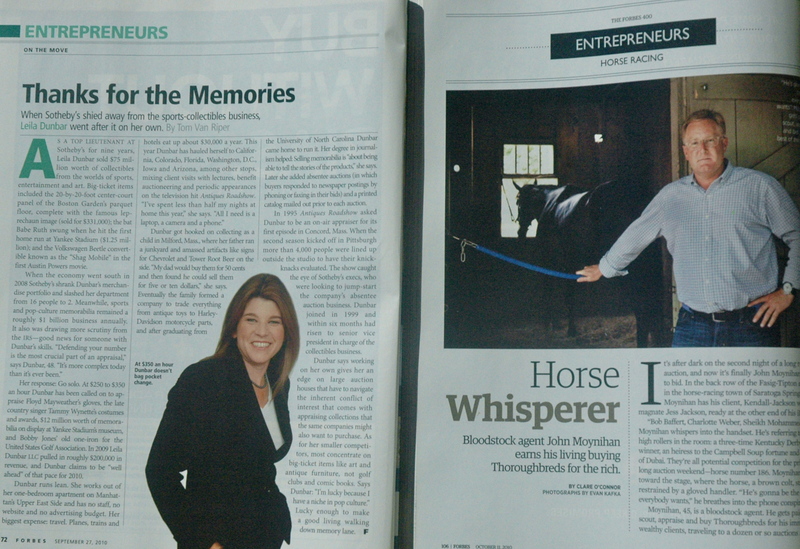 I had gotten BusinessWeek free for three years as part of my Executive MBA program. I loved it. I would spend a couple of hours every week reading it, fantasizing about how smart I would be someday and creating a mental image of how refined I already was for reading BusinessWeek in my spare time. So when multiple employees (many of them editorial) were let go last year, I was unhappy. I had read their stories, looked at their charts, absorbed their sidebars. I felt like this know-it-all millionaire had come into my playground and messed up the sandbox. I just was not going to play anymore. So what changed with the redesign? Everything. The covers are really intriguing — I’ve been watching them the last few months. I’ve just downloaded the new Bloomberg Businessweek iPad app that I plan to spend time with this afternoon, and next time I’m in the bookstore, I’ll pick up a physical copy. Some complaints I’ve read about it say that the magazine traded content for looks, or that the journalism has suffered so that the book will be more beautiful. I hope that’s not the case. Because now, after this year-and-a-half-or-so of being without the magazine, I want to open it again and enjoy it. Have you seen the new Bloomberg Businessweek? What do you think of it? Click through here to see some of the more interesting pages from the past year. Tags: Allan Sloan, Barack Obama, BusinessWeek, Forbes, Fortune, Inc., Time Inc. Published in New York, N.Y., by Time Inc.
Fortune is blessed with good writers and good story concepts. The writing is satisfying and the sidebars are relevant. Fortune dares to take on some of the big companies, even including an article on why you shouldn’t buy Apple stock. The design of Fortune is a little clunky occasionally. In general, the color palette is simple, masculine and bold. The illustrations are good, and the sidebar/chart treatment is pleasing. The photography throughout is very strong. But the clunkiness of the headlines is distracting. That font wasn’t cool decades ago and it isn’t cool now. Chunky nuggets: Fortune capitalizes on readers’ short amount of time to read by breaking the copy into bite-size morsels that still actually tell you something or mean something. The charts are attractively simple, the stats are interesting, and the information is concise. Headline font: Many of the headlines are typed in a thick, black Italic font that reminds me of magazines from the ’70s. It’s heavy and hard to read. This magazine is a good read and could hold my attention for a solid hour. Its online component adds even more value, with video and searchable content. But the business magazine market is saturated, and other contenders, like Forbes, BusinessWeek and Inc., are more visually breathtaking and have a better online presence. I give Fortune a B for its good content but lack of a wow factor. Forbes recently unveiled a redesign, one that its leader called a “re-architecture” of the magazine and the website. One of the main changes Forbes points out is the addition of reader commentary in the margins of stories in order to add more voices to the magazine. What struck me the most of the new design was the use of white space and the stripping out of color. 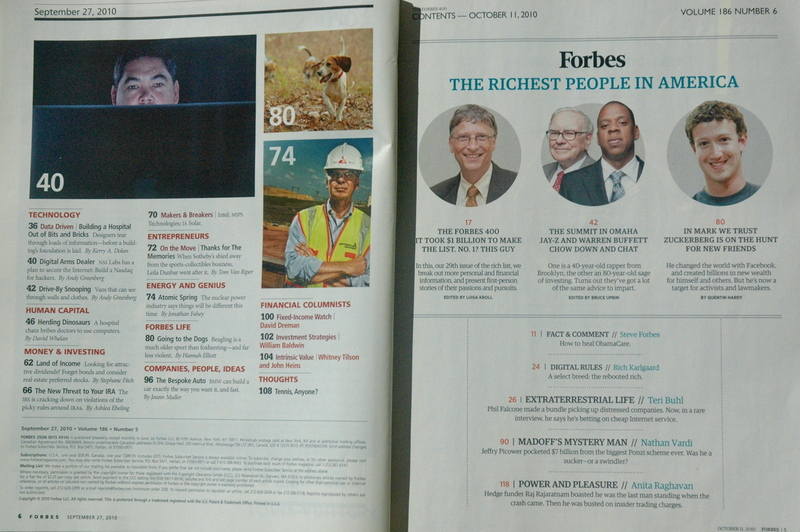 The redesign issue also happened to be the special Forbes 400 edition, so some, if any, of the changes may only be part of this current issue. So, here goes! 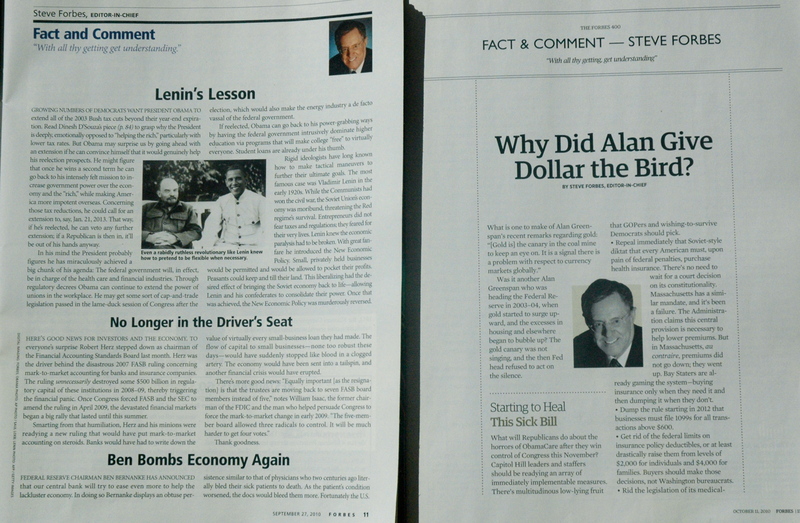 In all photos, the older issue (Sept. 27, 2010) is on the left, and the redesign issue (Oct. 11, 2010) is on the right. You can click on any photo to make it larger. Each section below is ruled a Fail, Pass or Win. 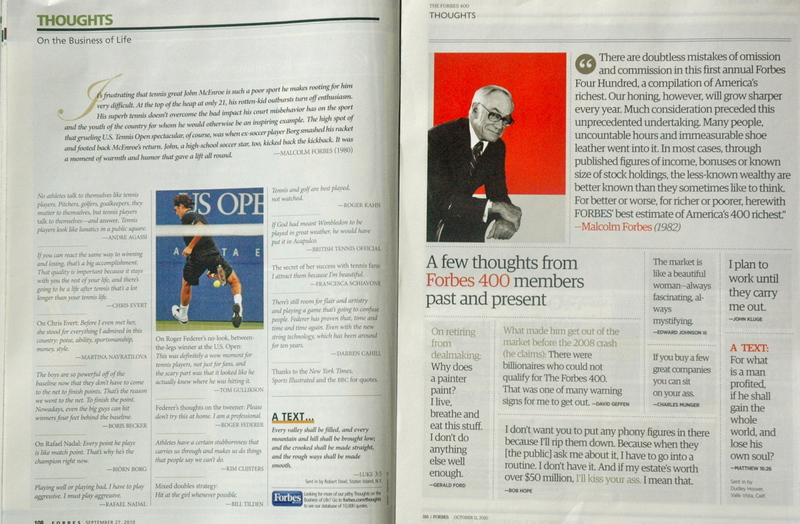 Forbes fills its cover with big personalities — both before and after the redesign. Forbes makes its readers feel important because they get to read intimate portraits of important people. 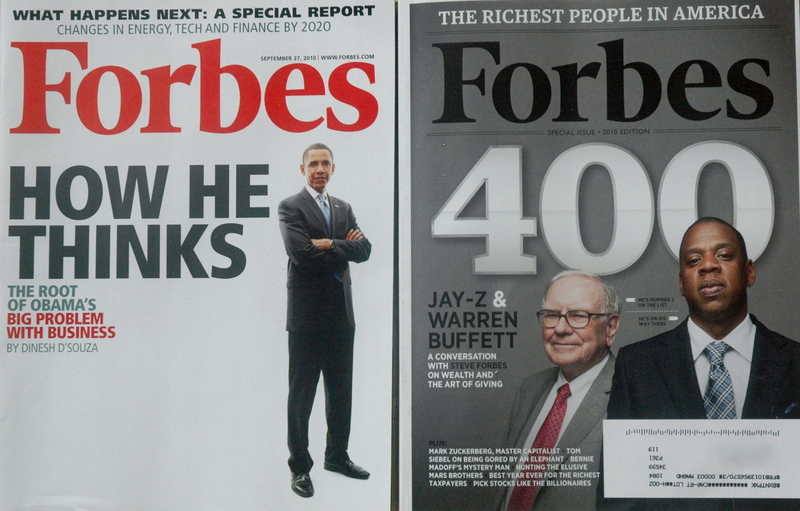 Nothing on the cover indicates that this is a redesign issue, but that’s really problematic to say because the Forbes 400 issue is also a special issue and gets different treatment. We’ll have to wait until the next issue comes out to determine that. Regardless, I give it a pass because newsstand magazines like this one take great care to appeal to the newsstand crowd, so I’m sure the powers that be know what they’re doing here. The contents pages are the first place the reader can start to see a shift in the design, to a more retro, almost newspaper look. The harsh reds and large photos from the previous contents are gone; subdued colors and an abundance of lines are introduced here. The new fonts are very pleasing; the titles stand out, and the designers use a lot of white space on the two pages of contents. The Editor’s Note, like the contents and like all the departments after it, showcase the new use of white space, margins and black-white-sepia tones. Steve Forbes goes from being the columnist (shoved up tightly in the corner) to being the main visual. No other photos appear on his two-page column, and the playfulness is removed from the second page on which restaurants to visit. The previous “playfulness” was color, which was stripped away by the designers. It’s almost like this new version is saying, “We don’t have time for silliness. We’re here to work.” If you don’t like the look that’s in the contents and editor’s note, you won’t like the rest of the magazine. It borders on plain, but it’s also more sophisticated, less busy. Entrepreneurs is another section in which the move away from color and toward white space is obvious. Some of the design elements are so subtle (for instance, the double lines above and below the section head, the dots coming from each side of the section head) that they make the pages feel elegant, even though stripping the color out seems like it would make the pages drab. Even the folios are simpler and more succinct. On the pre-redesign Thoughts page, the quotes just flowed, one into another, with nothing driving the reader to each one. I imagine many readers scan just to see if there are any names they’re interested in. If not, they read the first item or the one just under the photo and then close the book. In the redesign, though, the page draws the reader in on each item because all the quotes have something distinct — type size, leading, color, length. Fewer quotes are on the page, but each is markedly more readable. Forbes is made up of big personalities — untouchable by the masses, but brought to you, the reader, courtesy of the Forbes brand. 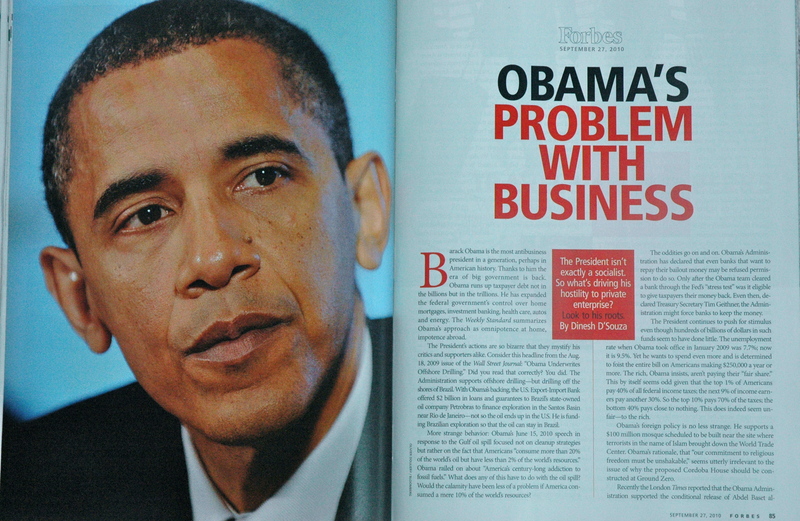 In the previous design (see photo), President Barack Obama was the lead story. In the new design, it was Warren Buffett and Jay-Z. The subjects didn’t change with the redesign; only a bit of the presentation. The change was subtle but pleasant, retro but current, simple but sophisticated. Have you seen the new Forbes? What do you think? This redesign has gotten a lot of attention: You can read an interview with Lewis D’Vorkin, who led the redesign, with Talking Biz News, a preview of it in Business Insider, or the announcement about it on Forbes.com.